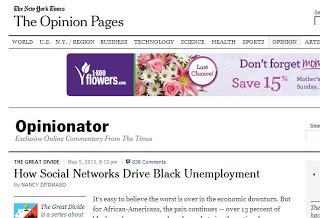 Do Social Networks Drive Autism Underemployment? This is a quick thought of the day, with apologies for good, solid blog posts being lacking from me over the past few weeks. Then again, it’s too much for me to squeeze into a tweet, and my mother thinks my blog posts are too long, so perhaps this will appeal to her! Take a look at this NYT Blog. They advance a very interesting idea that social networks function to extend and strengthen the secret connections that keep the wealthy (and dominant racial/ethnic/cultural groups) enfranchised. They do it by enhancing the ability of “who you know” to overpower “what you know” in being the person picked for the desirable job that becomes a great career or a stepping stone. It makes a lot of sense, since social networks allow easy access across strata of society to people, as long as they have the right connections (for instance, I routinely tweet with people who have 1/10 or 1/100th as many followers as me, or 10x or 100x as many followers as me, and we have a two-way interchange, although primarily because we are connected by the Autism Family). Without the right connections, however, Facebook, Twitter, and the like, are just as closed a door as any that existed before social networking. We already know that people with autism are unemployed and underemployed compared to other people at their cognitive levels. This spans across the Spectrum — cognitively impaired autistic people are much less likely to work than people with MR without autism. High functioning autistic people with college degrees or graduate degrees are also less likely to work than their “neurotypical” peers. I talk to parents all the time about the fact that much of this has to do with people with autism struggling to read the unwritten messages and follow the unwritten rules in job searches. They rock out in their classes and get high grades, but they don’t talk to their professor or their peers about their interests. They don’t engage their departments to parlay their interests and academic success into internships, volunteering opportunities, and entry level jobs. This is all about unwritten rules and networking. Are we overlooking one of the most powerful tools thus far in the 21st century, in the form of these social networking sites, and what they may be able to do for autistic people? We know (look at my timeline on Twitter, or check out the #AutismFlashFollow or #autismbullying hashtags!) that we have people with autism thriving on social media, as well as some who engage in it but are not engaged back. Maybe we need to think more constructively about helping people with autism develop social links on social media that are likely to generate jobs (because they may not automatically engage in using social media this way). Maybe the broader autism family needs to help build those links between people with autism on social media and the decision makers and other people who hold the keys to these invisible doors. What do you think? And if you’re an autistic person, have you used social media to land a job? Would you?